Have you ever been robbed by ruthless armed robbers? If yes, have you imagined a second chance to meet with the same hoodlums who attacked you? Imagine they have been arrested, disarmed and totally helpless and the mercy of witnesses and here you are face to face with them, what would you say to them? 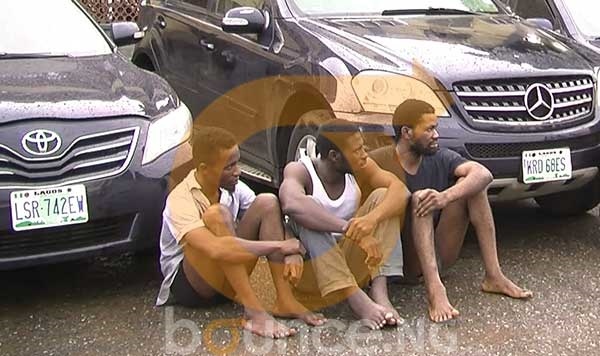 This was the scenario at the Force Headquarters on Monday, October 2, 2017 when Okediran Oluseyi met with the gang of ruthless armed robbers who attacked his home on September 5. He had a lot of questions for them, all at once. Looking at their subdued mannerism as they obediently responded to Oluseyi’s questioning, one wondered if they ever saw this day coming. Four weeks earlier, they were the ones shouting orders at the man, his wife and aged mother but now they took orders from him with tears. The tables had turned. He reminded them of how they beat him to unconsciousness, how they broke his wife’s leg. How they manhandled his aged mother and toddler. You could feel the pain in his eyes and hear hate in his voice. He was still bitter. "Which of you hit my wife’s leg with a mortar? Which of you broke bottle on my head? “Oga na me protect your baby make them no kill am,” one of them said to him, as if that heroic would earn him a medal of honour. Of course, he looked at him with disdain and walked away shaking his head before later narrating his ordeal to Bounce News. “Around 15 minutes before 2AM I started hearing sounds from my sitting room where my mother had slept off, I thought she was on the phone. “But they stormed into my room and immediately the guy broke a bottle twice on my head asking for the key of the Toyota Camry car which is not mine. “I told him it was not mine that I drive a Highlander (SUV) but he insisted on getting the key of the car. At that time, I had lost all my strength and my wife stood up to give them the key of my car. “They spent close to three and half hours in my apartment and went away with my blazers, five phones and other valuables including my wedding band,” he told Bounce News. The robbers also went away with the Toyota Camry that night but the police went as far as Onitsha in Anambra state to recover it along with some of the other items stolen from Oluseyi. Not many people live to tell their story. Oluseyi knows this much and he is still thankful for his life and that of his family.